As most of you know I've worked in the hospital for my entire nursing career and recently began a faculty position. I wanted to give an update on my first week as Assistant Professor. I've been quite busy getting adjusted to my new position (checking emails, attending meetings, developing curriculum, teaching and meeting stakeholders in the community, learning the ropes of the school/facility). I was so busy that I forgot to take photos of my office. So without further a do here are some highlights from my first week! 1) Microsoft 365 is awesome! Until this week, I never had a use for it in my previous jobs in the hospital or even in my personal life. When a colleague sends an invitation for a meeting to my email address -- I can click "accept" and BAM it's on my calendar! I like the OneDrive cloud, but I still think I'd rather save everything in one place so it's portable, so I picked up a thumb drive today. 2) Having MY OWN office is fantastic! My office is one of the first offices you see when you enter the department, so I have people passing by constantly. I thought it would be distracting, but it's actually comforting knowing I'm in my own little world, but people are just a few steps away. I haven't had time to fully decorate, but once I do, I'll be sure to share the photos. 3) I LOVE having two monitors to work on. Today I had 6 documents open and it was WONDERFUL having two monitors to work on. I swear it cut my time in half. I wish I had two screens when I did all of my graduate work, it would have made those long papers and discussion posts so much easier! 4) As soon as I arrive to my office, I turn on my computer and put on Pandora and play the Beegie Adair station to set a relaxing atmosphere. Thank you Tawnya for introducing me to such a wonderful station. 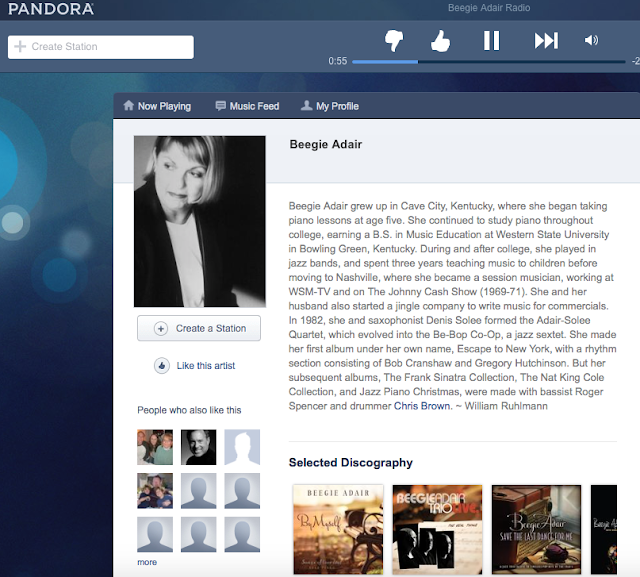 During our vacation to Kauai, Hawaii we listened to Beegie Adair nearly every morning before heading out to explore. During my graduate studies, I listened to this station while working on papers and assignments and found myself to be more productive when it was playing. LOVE this station on Pandora! 4) Educators are wonderful and friendly people! I worked in a hospital for 12 years and there were departments I would walk through and some people wouldn't even acknowledge you. On campus, everyone says "Hello" and most people actually approach me to introduce themselves. 5) My colleague stated her mother graduated from a diploma program and she truly believes diploma and associates programs create confident and successful RNs who can than pursue their BSN degree. 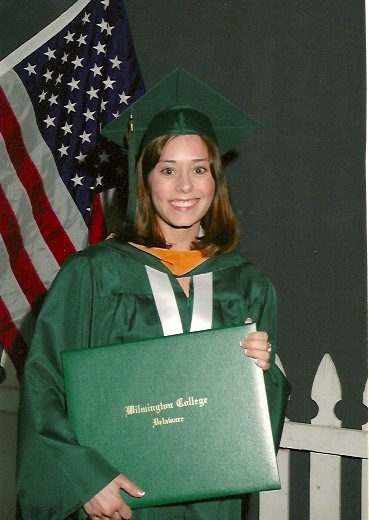 To my knowledge, there are less than 70 diploma programs in the United States and my alma mater is one of them. 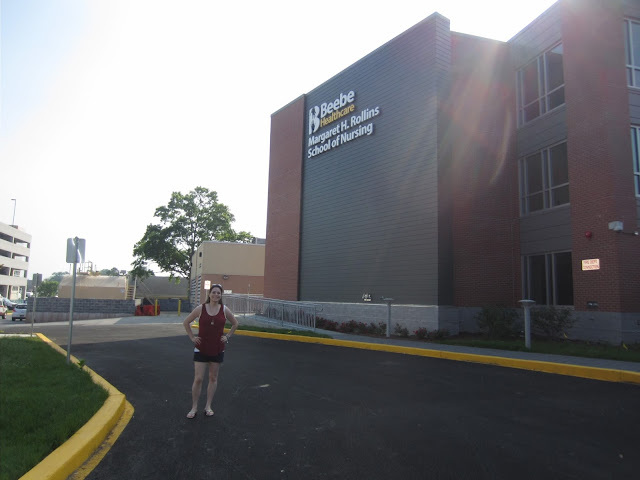 Here is a photo of me in front of my alma mater, which goes by a different name now. Please excuse my pasty white legs! During my graduate studies, many of my professors and classmates discussed how Baccalaureate nursing programs are the future of nursing education. I truly believe in the small class size, one-on-one direction from instructors in the lab and in clinical and the enormous amounts of clinical hours my diploma program provided for me. 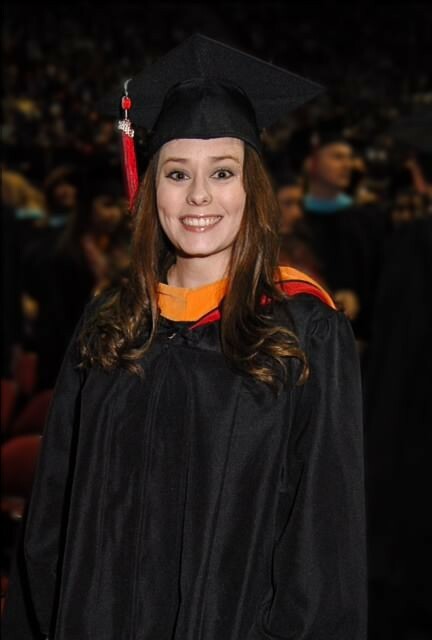 Upon my diploma graduation, I immediately enrolled in a BSN program, worked full time as an RN, saved and bought my own home at the end of 2004 and then graduated with my BSN in spring 2007. Now I've got my MSN and I wouldn't have done it any other way. 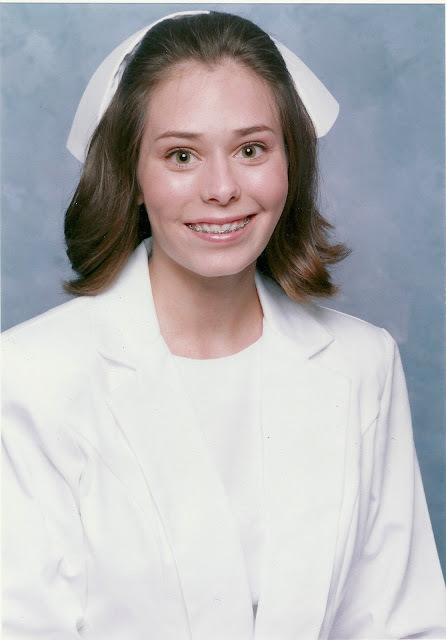 Now, it is my job as an educator (as well as other faculty) to encourage students to be successful and continue their education just like I did and many other nurses do. I've come a long way in my career and looking at my photos of my three graduations brought a smile to my face this evening. 5) I love the views from the campus! The campus is literally on the side of a mountain. I have two windows in my office, but it's only of the stairs and some desert landscaping. I'm lucky enough to only walk out of the building to enjoy the gorgeous mountain views of southern New Mexico. 7) This past Saturday was my first day of instruction. I had a smile on my face and thought: "This is the perfect job for me." It was only the "housekeeping" day of reviewing the syllabus, but I still felt comfortable in the classroom and I know I've found my niche. I can't wait for the official lectures and labs to begin! 8) When I left work this afternoon, I felt VERY accomplished. Last night, I researched backward curriculum design and felt much better after discussing it with my colleagues who have YEARS of experience. They were both super helpful, encouraging and positive. They even asked me to email them the resource I found online so they could share the information with other faculty. :) Now, I fell even more accomplished finishing up this blog post after a long day at work. Please leave a comment or two. I'd love to hear your ideas for inspirational quotes I could attach to my email signature. I'd also love to hear your experiences after beginning a new career! I hope your Wednesday was as productive as mine!